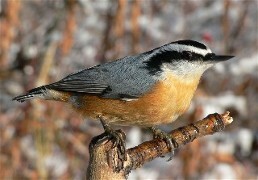 While a permanent resident in its breeding range, the Red-breasted Nuthatch sometimes migrates south during periods of a short food supply of conifer seeds. The Red-breasted Nuthatch measures about 4 1/2 to 5 1/2 inches in length. With a black cap, black eyeline, and white eyebrow. 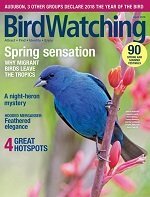 Considered monogamous, these birds carry out their courtship displays at the top of trees. 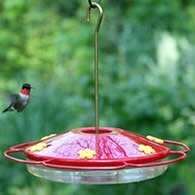 An interesting note about these birds is their habit of placing droplets of resin, or pitch, from balsam fir, or pine trees to smear around the entrance hole of the nesting site. The reason for doing this is really unknown. Speculation is to keep ants and small mammals from entering. The female lays 4 - 7 eggs that are white and finely spotted with brown. Incubation last about 12 days. Sources differ on whether the female or both sexes incubate. The young leave the nest 18 - 21 days after hatching. 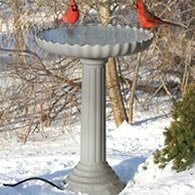 Their diet consists of conifer seeds and insects. 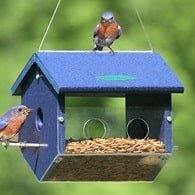 You can attrac them to feeders filled with sunflower seed. 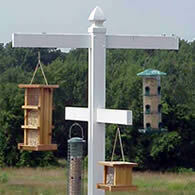 A suet feeder can also be use to attract these birds.